Kitchen cabinets made from concrete blocks and removable patches of carpet that function as flip-flops can be found inside this Tokyo apartment by architects TANK. Elsewhere, the architects also used concrete blocks to create low partitions defining the boundaries between rooms. The only fully enclosed rooms are the adjoined toilet and bathroom, which are entered though a stainless steel door. Polished stainless steel also provides mirrored kitchen worktops that reflect the unfinished ceiling and exposed electrical cables above. Suspended curtains in clashing patterns provide privacy screens around the bedroom area. 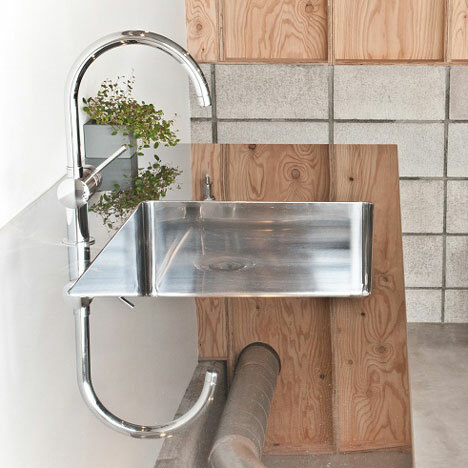 Tokyo studio TANK are not to be confused with French firm Tank Architectes, whose work you can see here. Photography is by Eric Bossic. This house is for a husband and his wife who have a lot of hobbies such as cooking, cycling, and so on. The client wanted large cooking space,working space, and an ideal bath room, mortar floor, and the skeleton ceiling. On the way of this planning, we consider how can we create this ideal house with efficieney and save money. We made a proposal to use concrete blocks as a kitchen counter, partition, and storage, same way as a bath room division. There are suite for brutal taste. We found that the ceiling is covered by heat insulating material at the time of disassembly working. So we used cement board to covered them, and we dare to put bare electric wiring on the cement board, it seems like skeleton ceiling which was the client wanted. This ceiling make feeling like in the high and large space more than before. The door of the bath room is stenless swing door which are often used at kitchen space or back yard of the restaurant. The door match with counter material, the mortar floor, concrete blocks, stenless, larch wood. And these make great harmony. So this house can use as to be in a Gallary or Cooking studio or any other working space as a whole. It would become an unique house to make many creativity.